After a wonderful two weeks of teaching weeks in Cebu, Philippines and surfing in Siargao, Philippines, i have finally arrived in India. The instant sight of black and yellow rickshaw taxis and the smell of burning dung and exhaust is somehow comforting as I make the 4 hour taxi ride from the Bangalore airport to Mysore. 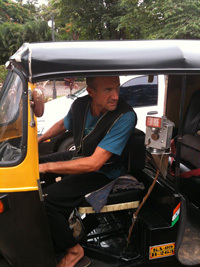 On the taxi ride, my first cup of Indian Chai is received with a huge smile. I have lost count actually, but it is probably my fifteenth trip to Mysore. The shala is relatively full. At registration, Sharath gives me a 6:00 start time. The weather is amazingly confortable. It seems I have been hot the last 8 months traveling in Asia and Europe – or is it Global warming? 😉 I am seeing lots of familiar faces, lots of hugs and hellos. It is good to be back in Mysore again…ready for another month of focused practice. Om Namah Shivaya.